Your question contains the answer, and sort of suggests a different question at its heart. The major cost to anything in space is launch costs. Answer: Reduce launch costs. Thus a better question is, what can we do to reduce launch costs? One example question with answers would be this one: How can new LEO manned launch vehicle development costs be reduced? Next answer would be, stop launching entirely and move to a totally different method, like a space elevator, and here is a good question with some answers: What is a "space elevator"? Once you have reduced launch costs, then it is much easier and cheaper. But still everything will cost a lot. So next you can look at lighter, simpler structures. Perhaps insitu resource usage as best as possible. There is work on making cement from lunar materials, which could mean building structures heavy bits from native materials, with perhaps only an inner airtight lining needing to be launched? Referring the answer of geoffc who has included reasons and the key process for reducing launch cost, I will include something that has to do with Moon bases since you have mentioned it in your question. Also geoffc has mentioned option for new materials lighter and simpler structures. I would be more specific by linking Moon base cost not only with the technology that can be used to build them, but also with the cost of launching them beyond low Earth orbit (LEO) to the Moon. For the Moon bases could be considered as option expandable space habitats which has been studied for years, but now in this days more seriously has been studied and developed by Bigelow Aerospace Company which has invested a lot in this field. The company is testing Bigelow Expandable Activity Module (BEAM) at International Space Station (ISS) and if it is successful they will continue developing this technology for future projects such as new space stations, Moon and Mars bases. 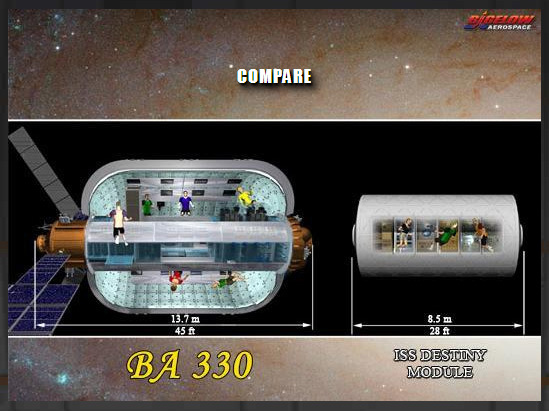 B330-MDS module ( 330 m3 habitable volume ) is proposed as an option for Moon base which would require three of them. This Bigelow space habitats are lighter, cheaper (less $ per cubic meter) and with much more living space than traditional metal space habitats. Also they are considered better for radiation and space debris protection which are very important for long duration missions in Moon bases, but it remains to be tested. In this way we don’t need to invest in this traditional types of space modules by making them even more expensive that they are, to achieve the Bigelow space habitat standards, but to concentrate more in this new technology if it is successful. Since expandable space habitats give more living space we can put on the Moon less number of this space habitat modules compared to traditional metal modules. So for example just for comparison, instead of 3 traditional modules with capacity of a Destiny class module ( ISS module ) with 106 m3 habitable volume and 15 tons mass each of them ( 45 tons in total), we can use only 1 B330-MDS module (20 tons, less than half of 3 Destiny modules mass) which means less number of modules so less number of launches. But the expandable modules are also lighter and tightly packed to take less volume in the payload fairings of the rockets before expanding in space. So we could say that in the future developments of the expandable modules concept, in 1 rocket launch we can pack inside the payload fairing more than one of this types of modules instead of traditional modules which can’t change their form. Conclusion is that we can put in LEO and Moon surface less number of expandable space habitats (because has more living space) with less number of launches by the same rocket (because are lighter and can be packed tightly) instead of launching current metal space habitats. Less launches of the same rocket means less cost and the total cost of the project will be lower. The expandable space habitats concept it is not yet proved as successful and certified operational but it is a good concept that could make space exploration easier, cheaper and safer, so in to the future if it successful could be very important to invest more in this technology. Not the answer you're looking for? Browse other questions tagged launch the-moon reuse cost-to-orbit or ask your own question. Could parts be salvaged off the Apollo thrusters found on the ocean floor? Is it possible to fly with Soyuz spacecrafts around the Moon? Are there relevant resources on the Moon for civil engineering?